The Atlantic and the Paciﬁc bumper are two of the smaller members of the jack family. Both species have not been greatly studied, and there is some speculation that they may be the same. Although the bumper doesn’t have a high back, it has an extended belly and a very thin body. With an overall silvery coloring, it has greenish tints on the back and yellow highlights on the sides and the belly. It also has a yellowish tail. There is a black spot on each gill cover and a black saddle on the base of the tail. Bumper rarely weigh more than half a pound and can reach a length of 10 inches in the western Atlantic or 12 inches in the eastern Atlantic. Small bumper have been observed in offshore waters, but they frequently range along sandy beaches. They travel in extensive schools, and juveniles are often found in association with jellyﬁsh. In the western Atlantic Ocean, Atlantic bumper are found north to Massachusetts, off Bermuda and south to Uruguay, as well as in the Caribbean Sea and the Gulf of Mexico. Bumper are said to be absent from the Bahamas and the Caribbean. The Paciﬁc bumper ranges from Peru to California. 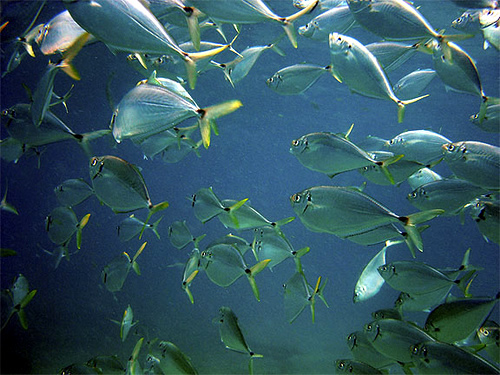 Inhabiting brackish and saltwater, bumper occur over soft bottoms in shallow water. 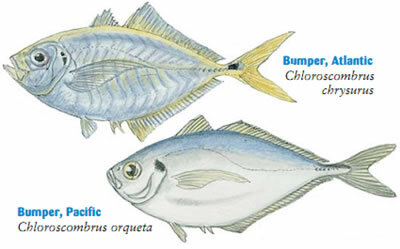 They are common in bays, lagoons, and estuaries.